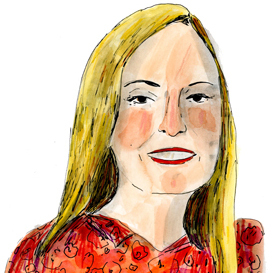 Phillips Head Librarian Karen Schneider shares the story behind Jacob Lawrence’s Migration Series. 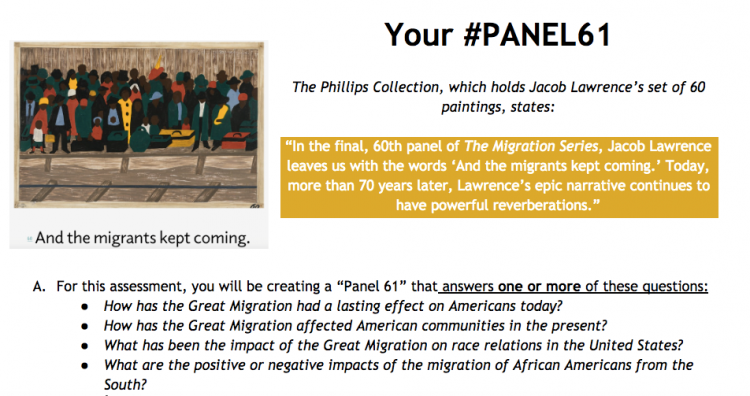 Learn more on the Phillips’s Jacob Lawrence: The Migration Series website. Jacob Lawrence’s Migration Series, which chronicles the migration of African Americans from the rural south to the industrial north between the two world wars and beyond, is a unique masterpiece of storytelling. Lawrence was born in 1917 in Atlantic City on his parents’ way north from South Carolina and Virginia. When Lawrence was a boy, his mother could not afford to keep him, and he lived in a series of foster homes until she sent for him to join her in Harlem when he was 13. The Harlem Renaissance was in full swing, with artists, musicians, and writers all contributing their creative vitality. As a teenager, through the luck of a free after school art program, Lawrence discovered a powerful means of expression. He studied with Charles Alston, one of the few African Americans at that time with a master’s degree. As a teenager, Lawrence walked the 50 blocks from his apartment in Harlem to the Metropolitan Museum of Art. Although Lawrence, as an African American, was permitted in the museum, he was closely watched by museum security staff, contributing to an uncomfortable atmosphere. 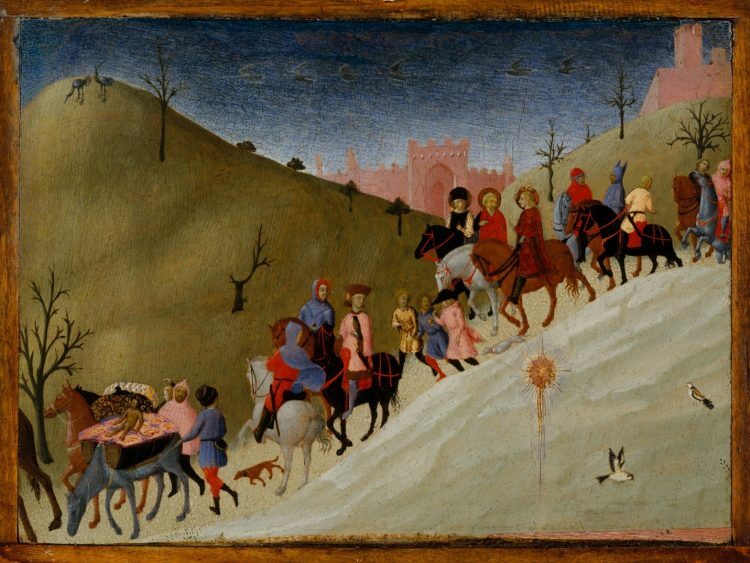 Young Lawrence gravitated toward works from the Renaissance, including The Journey of the Magi, a painting by 15th-century Italian artist Sassetta that shows a procession of figures walking down a steep slope, with the Star of Bethlehem hovering before them and a V shaped line of birds flying above. Decades later, when the artist was in his 60s, he joined New York Times arts reporter Michael Kimmelman for a visit to the Met. Lawrence immediately made a beeline for the same work, where he noted the painting’s power and deceptive simplicity. He said, “I can’t think of a better term to describe the effect than magic.” As Kimmelman observed, Lawrence noted its geometry, simplicity, vivid colors, and the way it tells its story directly, qualities that described his own art. He used aspects of Sassetta’s composition in Panel 3 of The Migration Series which depicts African Americans on their journey North, carrying sacks and suitcases, with a V shape line of birds dotting the sky, just as in Sassetta’s panel. When their visit was over, Lawrence turned to a guard to ask directions. The guard recognized Lawrence: “I just want to tell you how important your work is, and how much it’s meant to me.” The artist smiled warmly, shook the guard’s hand, and left the museum. Lawrence could not afford expensive art supplies, so he used tempera paints that could be purchased for a dime. He deliberately limited his palette, which he thought created a more powerful composition, stripped to its bare essentials. When he was a young man, he created series of works comprising 20 or 30 panels each on such heroes of African American history as Harriett Tubman and Frederick Douglass. Lawrence decided to paint a series about the Great Migration and received a grant of $1,000 from the Rosenwald Foundation which enabled him to work in a studio with neither heat nor running water for a year. The studio’s size was such that he was able to work on all 60 panels at once. Ever the teacher, Lawrence included his wish to exhibit The Migration Series in schools as part of the grant application. Lawrence had never been to the South and he was hungry for information on what it was like to live there. He spent more than a year doing research in the Schomburg Center for Research in Black Culture at the New York Public Library in Harlem. This is the only art work that I know of that had its beginnings in a library. Lawrence pored over books, periodicals, photographs, and first person accounts about the Great Migration. 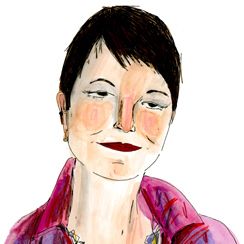 His friend and fellow artist Gwendolyn Knight, whom he later married, helped Lawrence write the captions for each panel before Lawrence started to paint. The captions consist of one or two sentences that crystallize the meaning of each panel. Stay tuned for part two of this blog post. Kelly O’Brien teaches African American History at The Milton Hersey School in Hershey, Pennsylvania. 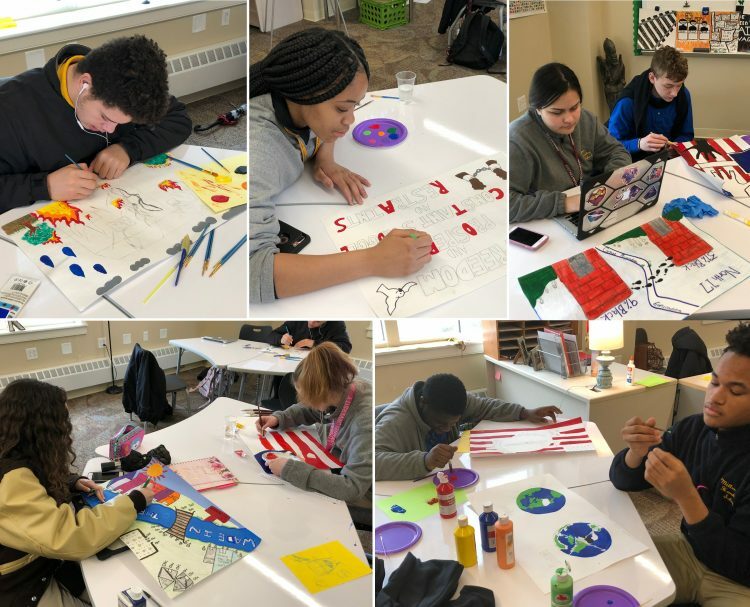 Her class studied the Great Migration and used the Phillips’s Jacob Lawrence: The Migration Series website as a resource, including imagining what Panel 61 of the series would look like. Explore their artworks and read about how Ms. O’Brien’s class learned from Lawrence’s artwork. In this unit, we began by considering the origins of the Migration by simply looking at the historical background using resources like PBS’s “Many Rivers to Cross” website and documentaries. We also considered the personal experience of the Migration by studying excerpts from The Warmth of Other Suns by Isabel Wilkerson. Finally, the students examined Jacob Lawrence’s panels and created a brief timeline of how Lawrence envisioned the Migration. From there, the students were challenged to make their #Panel 61 with the following assessment. You can see how many of their paragraphs are responses to these questions posed. 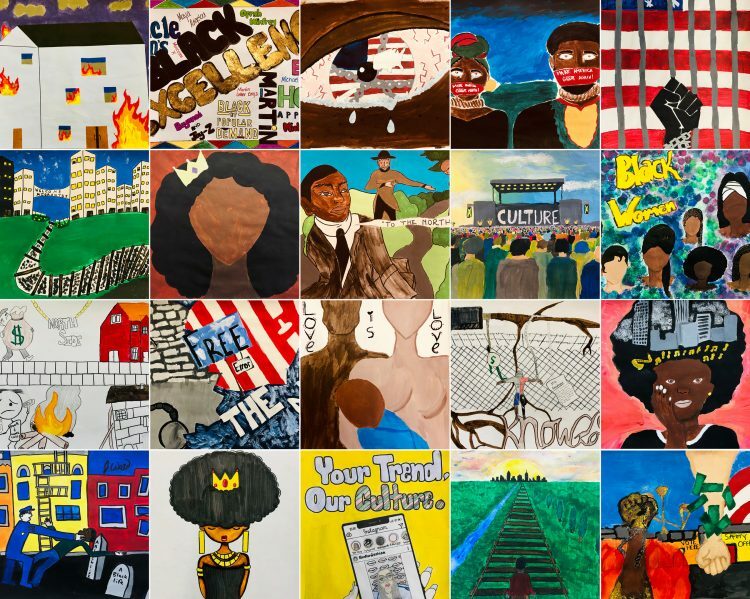 What’s really neat is the variety of thought processes that the students depicted in their artwork, and the “buy in” from the students because they voted at the end to choose several for submission to your website. They got really excited about them and wanted to do very well. Before creating, I heard students talking about their ideas and how they see certain legacies of the Migration in their communities, in their schools, etc. It is very meaningful. According to a letter to Edith Halpert on January 10, 1946, Duncan Phillips exchanged an elaborate still-life by Pippin, Victorian Interior, for this painting, thereby showing a preference for the somber monotones and “restrained colors, black, white, gray, with touches of red” found in this picture. Though vastly different in mood from Domino Players, The Barracks shares with that painting a strong abstract design and an evocative sense of place—two qualities dear to Phillips. Both pictures are a synthesis of memory distilled into images of great power. In The Barracks, Pippin drew on memories of World War I. In March 1917, Pippin joined the New York State 15th National Guard, an African American unit that became the 369th Infantry Regiment when it was incorporated into the U.S. Army. Pippin’s entire war experience abroad centered in France. He was wounded and returned to New York in January 1919, yet it was not until 1945 that this crowded, claustrophobic memory of the animal-like existence of war surfaced. Where another artist might have approached the loss of identity that accompanies military service with a bird’s-eye view of numerous soldiers in formation, Pippin was selective. By including a few individual soldiers arranged on a grid, he evoked the painful quashing of identity that war brought on. The painting also serves, however, as a poignant reminder of racial segregation even in the face of battle. 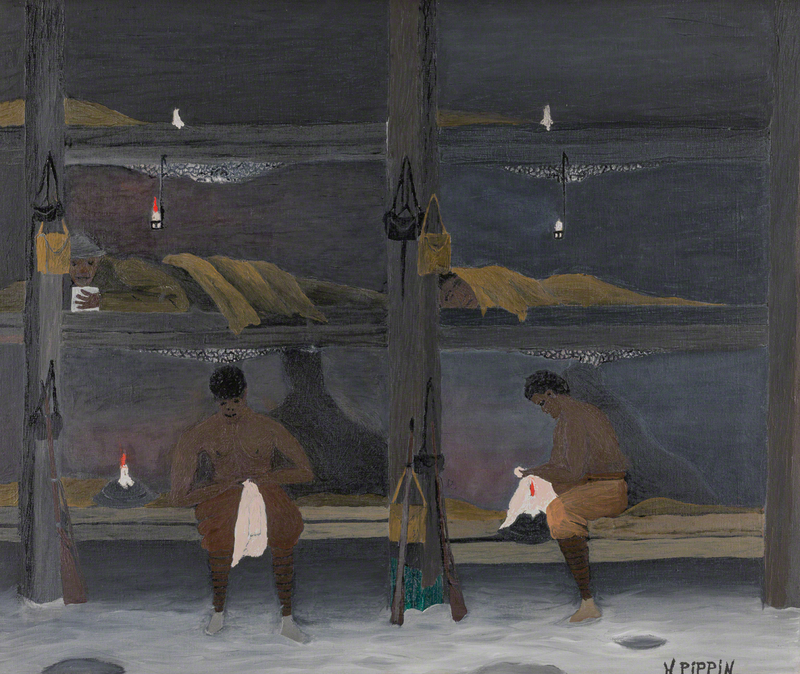 The Barracks is one of Pippin’s most carefully composed paintings. By including an ashen floor in the foreground, Pippin both softened and lightened this painting. This area appears to be lit by an unseen source much stronger than the candlelight by which the men work or read, perhaps a result of Pippin’s method of working at night under a bright light. Both the eerie light and the wide perspective that interrupts the sense of spatial continuity, detach the scene from the viewer’s space, evoking a universal image of the forlorn monotony of soldier’s lives in wartime.